Meet some of our incredible women! Karen came to Mi Esperanza in 2009 when she was 22 years old. Karen has one daughter who is now 6 years old. Karen came to Mi Esperanza looking for an opportunity that would help her to support herself and her daughter. Having no skill training or formal advanced education Karen was finding it very difficult to earn a consistent living. 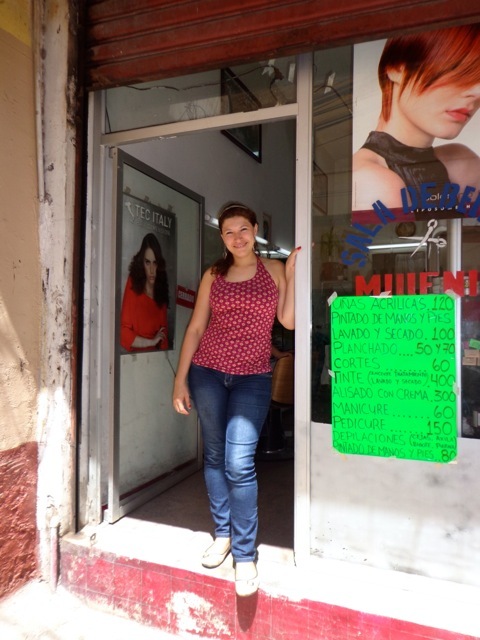 Always having an interest in beauty the Mi Esperanza beauty school was a perfect fit for Karen. Karen was a dedicated student that worked very hard at her studies. After graduation Karen went to work in the salon where she did her internship and worked there until the salon closed. Immediately following loosing that job opportunity she found a job at Acyrilica's Salon and has been working there for the past 1 1/2 years. She is very happy at her job and her employer is very happy with her. Her responsibilities at the salon are manicure, pedicure, shampoo and massage. Karen continues to learn and looks forward to expanding her skills and her responsibilities at the salon. Karen is very happy to be working and supporting her and her daughter. Karen in front her Salon Millennium! Co Founder Lori Connell and Karen during our 2013 visit. When we arrived at Millennium Salon we found Karen working with a salesman buying product for HER salon. 10 months ago the salon where Karen worked closed and it was then she decided to open her own salon. Millennium has now been open for 9 months. Karen is excited to be her own boss. She says it is hard work, she works 5 days a week 7-5 but loves building her own business. Since our last visit Karen has gotten married and had her second child. Karen simply says "Mi Esperanza changed my life!!"